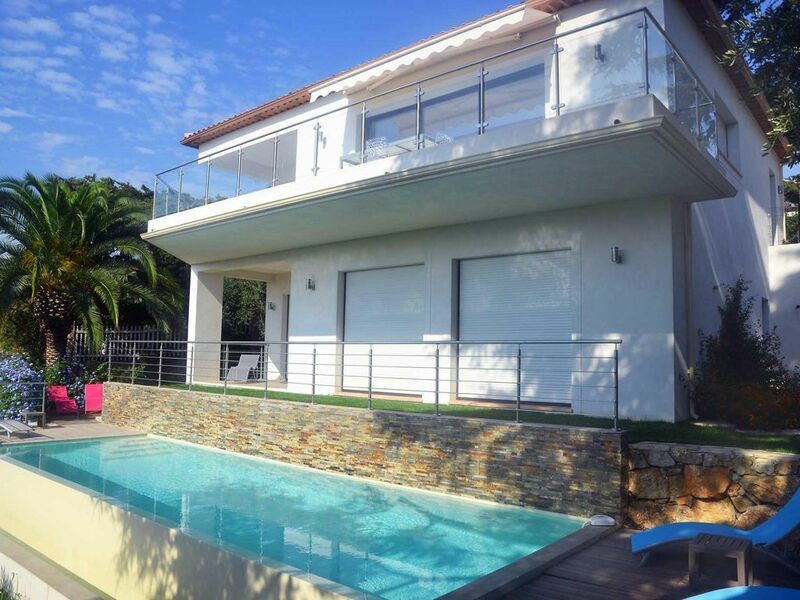 New villa near the beach, the "Croisette and rue d'Antibes". In town, in a quiet residential luxurious area called "Californie". "The house we stayed in is most amazing and beautiful property, with nice garden and awesome swimmingpool. If only we had better weather, we''d enjoy it even more, but everything that was in it, from beds to appliances was new and I can only highly recommand it to anyone travelling to Cannes"
"This home was amazing!! My wife, our three girls, and I stayed here in Aug 2011, and the home is perfectly situated in the hills overlooking the port in Cannes. The home is of modern architecture and decor, which is exactly what we were looking for. The home is centrally located, and is about a 10 minute walk to the beach (though it is mostly uphill on the way back - but well worth it, unless you are carrying little kids!). All in all, we highly recommend this home for vacation - perfect all around. And...the owners were extremely nice and accommodating - we'll be going back to Cannes again, and will be staying here - if it is available!" Die Villa hat unsere Erwartungen voll und ganz erfüllt. Sie liegt in zentraler und dennoch ruhiger Lage in einem schönen Villenviertel. Das Zentrum von Cannes ist zu Fuss in 10 min zu erreichen. Alles war sehr sauber, sehr gepflegt und wir wurden vor Ort sehr freundlich empfangen. Für uns ein rundum gelungener Urlaub. Villa Soleil is a wonderful for a Cannes vacation! We have been coming to Cannes for many years and this villa is the best we have yet found. It has the most fabulous view of the bay and the town and a really spacious terrace from which to take it in. Very unusually for houses with a great view, it is within easy walking distance of the town centre and the beaches. It's beautifully furnished and well equipped and has a lovely pool. We look forward to many return visits! Das Haus ist sehr modern, verfügt über alles, was man für einen Urlaub benötigt. Man hat einen wunderschönen Blick aufs Meer, ist in 10Minuten zu Fuß sowohl am Meer als auch mitten in Cannes! Wir haben unsere Woche im Haus sehr genossen. Outre la vue mer extraordinaire qu’offre la villa, son emplacement est pratique (10-15 min à pieds de la croisette) tout en étant au calme, au bout d'une impasse. Habitués des locations, nous avons particulièrement apprécié l’incroyable équipement mis à disposition (TV salon & dans les chambres, frigo avec distributeur glaçons, four trad et micro ondes, machine à laver la vaisselle, le linge, machine à café Nespresso, radiateurs chauffe serviettes, fer à repasser, bbq, même le sèche cheveux !! - rien ne manque ! ), tout cela dans une maison moderne équipée d’une belle décoration, avec places de parking dans jardin clôturé. Tout est parfaitement organisé; les infos avant la venue, l'accueil sur place par Elodie, les manuels explicatifs de la maison, les petites réserves pour l'arrivée ( produit vaisselle, tablettes machine, savon mains, sel ou huile etc), bref tout ce qui facilite la vie et qu'on n'ose espérer - c'était extra ! Seul bémol: la piscine chauffée qui n'est pas très chaude hors saison car pas couverte, donc ne pensez pas vous baignez au chaud en octobre ! By car : 20 minutes of the A8. By train : 15 minutes of the Cannes station by walk.